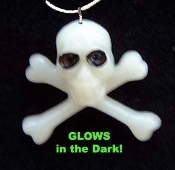 SKULL and CROSSBONES GLOW in the Dark PENDANT NECKLACE - Halloween Pirate Charm Jewelry - GID (GLOWS WHEN EXPOSED TO BRIGHT LIGHT. NO BATTERIES NEEDED) Plastic charm, approx. 1-1/4-inch tall x 1-1/2-inch wide, on 18-inch Neck Chain with safety clasp.